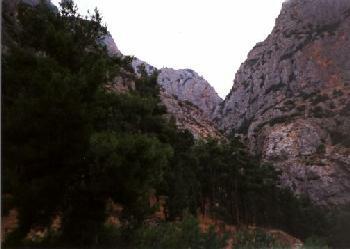 In the mountains of central Greece above the Pleistos river gorge, on Mt. 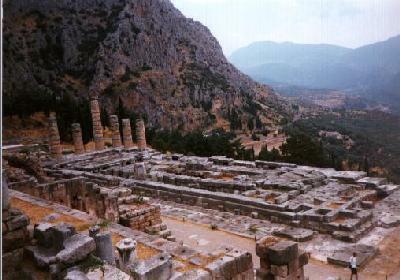 Parnassos lies the ruins of Delphi, site of the oracle and sanctuary of Apollo (god of (true) light and the sun.) This site was one of the two most important sanctuaries of Apollo. The other being his birthplace, Delos. Fitting into the pattern of other ruins, such as Mycenae and Olympia, Delphi is located in one of the most beautiful mountain ranges in Greece. The oracle that was located at this site was said to be founded by Apollo. Upon climbing Mt. Olympus and becoming a god Apollo is said to have set in search for a site to have his oracle so he can spread his word and insights as well as those of his father, Zeus(king of the gods). 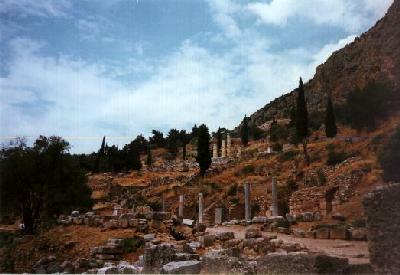 He came across Delphi and chose it as the location of his oracle. However, the site was already an oracle for Ge (mother of Kronos and the other Titans, and his great grandmother). Ge's Orcal was guarded by a ferrous python and Apollo was forced to slay the python to be able to place his oracle on the site. He then found some sailors and "enlisted" them to become his priests. 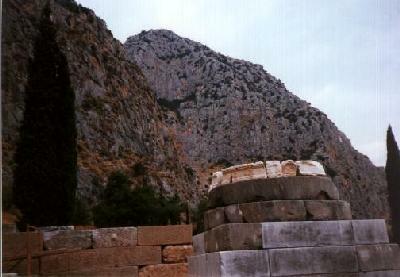 Apollo was said to be at the his oracle from March to November. The three months he was away, Dionysus (god of wine, music and dance)was said to tend the oracle. 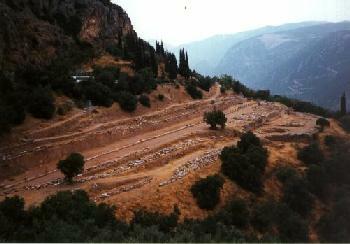 For several centuries people came to Delphi to here the prophecies of Apollo through his priests. Upon arriving at the site pilgrims first had to purify them selves in a sacred spring. Then they would move on to the temple of Apollo. Upon entering the sanctuary it was custom for them to leave a gift to the god. The "sacred way" up to the temple its self was lined with large statues as well as treasuries, buildings where towns would leave gifts. After leaving their gift they were required to sacrifice a goat. If the omens of this sacrifice were good the person was allowed to enter the temple. Oracle's were given once a month and would attract people from all over Greece. Giving the oracle involved a complex ritual. First a priestess of Apollo (called the Pythia) and the priests had to perform a special rite. After purification the group would enter into the inner sanctum of the temple. In the inner sanctum , aside from a statue of the god, there was a navel-stone of the earth, and a bronze tripod over a crack in the ground. The Pythia would sit on the tripod, inhale vapors and munch on laurel leaves (See Daphne ). This combination would put the Pythia into a trance where she could pass the word of Apollo. She would talk in an incomprehensible tong, after all it was coming from a god, and the male priests would translate for the person. Because of the importance of this oracle people from all over Greece came here and it became a center of trade. Because of this the priests were able to keep abreast of current events, I'm sure aiding them in their translation of the oracle's. The oracle's given were often vague as well. One king the oracle told if he went to war he would destroy an empire. So the king thought this was to mean he would win so he went off to war. An empire was destroyed because of the war, his own. Theseus, Oedipus, and Orestes also had their "fates" told to them by the oracle. The oracle of Apollo and Delphi became very rich and powerful with trade and the "gifts" people brought there during both the Roman and Greek periods. When Christianity became the official Religion of the Roman (soon to be Byzantine)empire the site was sacked and destroyed. 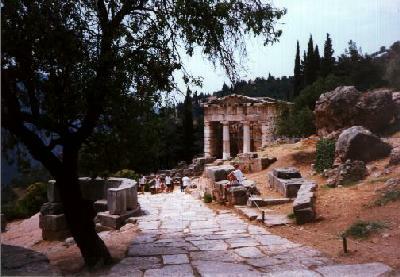 The Michelin Green Guide says that a trip to Delphi is one of the most exceptional trips a person can make in Greece. I hope you enjoy the photos. Any comments, please E-mail me, . The Sacred way was lined with Statues and several "Treasuries". The statues were all left as "gifts" to the god for his oracles. Cities would leave their gifts in special vaults called Treasuries. The one of the Athenians is the best restored.